The books I couldn't part with today. 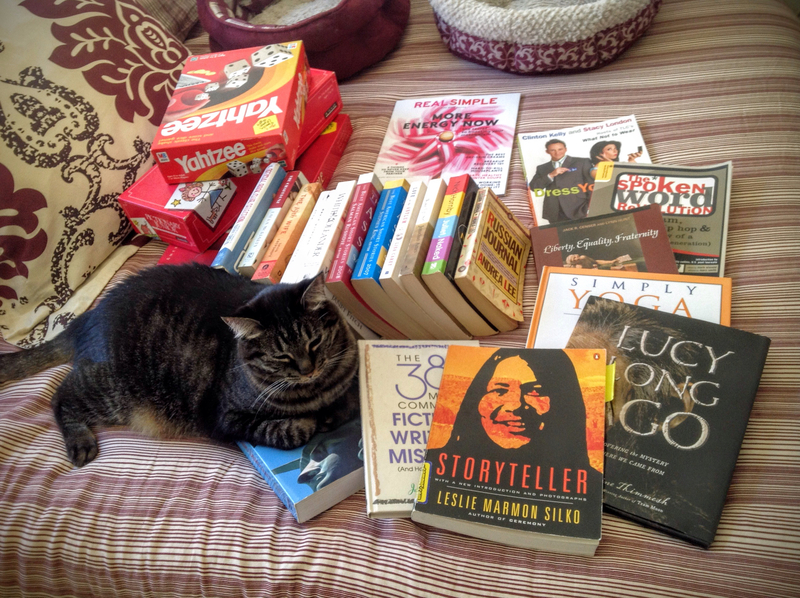 Day 8 of the So Damn Domestic Clutter Free Countdown and today I set out to sort books. I decided to pick out 23 books that I'd read already. I figured if I want to read them again I can get them from the library. I even allowed myself a Priority Keep category, for books like Hyperbole and a Half and The Art of Asking, which I want to have on hand to grab at a moment's notice if I ever doubt myself. Problem was, jump down even one priority tier, thinking I have to get rid of anything below life-altering/referenceable, and I start freaking out. It makes sense. One tier down from Priority Keep is fiction books that truly moved me. I connected with the characters and the language. I had epiphanies or moments of comfort. Of course it would be hard to say goodbye. 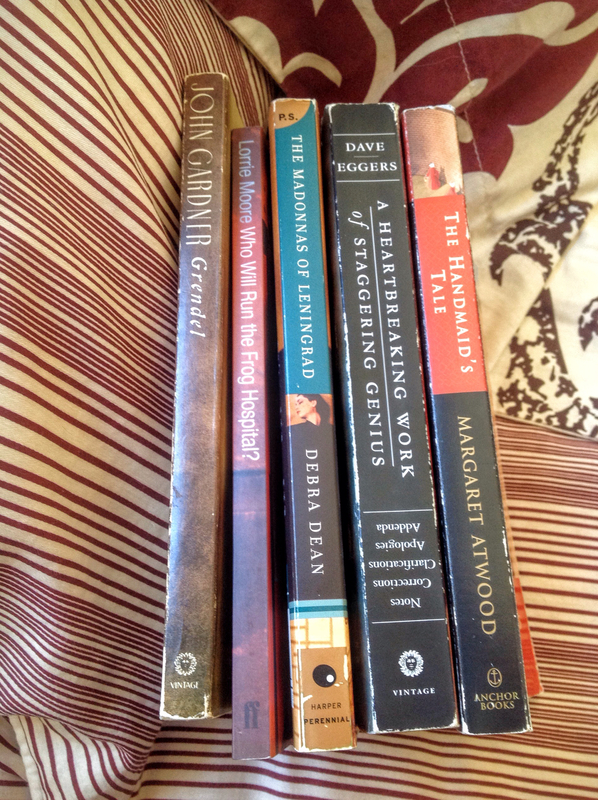 I took five books out of the declutter pile I'd made, the ones that were breaking my heart the most. Once I did that I felt 1,000 times better. I realized nothing else in the pile gave me anxiety. Well, maybe a little. There's still a lot of really good books in today's declutter. But it gives me more joy to release them into the world than to hoard them. 1. Grendel by John Gardner. "I cannot believe such monstrous energy of grief can lead to nothing!" 2. Who Will Run the Frog Hospital by Lorrie Moore. 3. The Madonnas of Leningrad by Debra Dean. 4. A Heartbreaking Work of Staggering Genius by Dave Eggars. I will continue to work on non-attachment and see if I can find a way to let these go. But if I end up with two shelves of books to keep at the end of this countdown, that still frees up two shelves for other art, or breathable blank space, which any designer knows is a key component of good design. More importantly, perhaps, it simplifies something in my life. I have a feeling that I will read more when I own fewer books. It's easy to take them for granted when I own them. They'll always be there, so I'll read them "later." I'm in a couple book clubs, so most of my active reading happens with library books already. Even though I have tens of books on my shelves that I haven't read, I'm reading library books anyway. That's quite an observation. In any case, today's books are ones that I have read, and I have loved, and now I will pass them on. All links go to Amazon, except this one: If you'd like to follow me on Goodreads, you can find me at www.goodreads.com/sweetlovetruly. 1. Official Book Club Selection by Kathy Griffin. 2. The Chaperone by Laura Moriarty. 3. The 19th Wife by David Ebershoff. 4. Snow Falling on Cedars by David Guterson. 5. White Oleander by Janet Fitch. 6. The Best American Short Stories 2008 edited by Salman Rushdie. 7. The Best American Short Stories 2007 edited by Stephen King. 8. Love in the Asylum by Lisa Carey. 9. Wake Up, Sir! by Jonathan Ames. 10. Juliet, Naked by Nick Hornby. 11. Russian Journal by Andrea Lee. 12. Dress Your Best by Clinton Kelly and Stacy London. 13. The Spoken Word Revolution edited by Mark Eleveld. 14. Liberty, Equality, Fraternity by Jack R. Censer and Lynn Hunt. 15. Simply Yoga by Yolanda Pettinato. 16. Lucy Long Ago by Catherine Thimmesh. 17. Storyteller by Leslie Marmon Silko. 18. The 38 Most Common Fiction Writing Mistakes (And How To Avoid Them) by Jack M. Bickham. 19. Approaching Democracy: Second Edition by Larry Berman and Bruce Allen Murphy. 21-23. Board games. They fail the "Have you used it in a year?" test, and are soooo much easier to give up than books. I feel good about this list. These books inspired me, made me cry, formed memories. They will be a part of me, whether I own them or not. A note about affiliate links: I recognize the potential hypocrisy in including links to products for sale in a post about my efforts to minimize. The thing is--when you follow one of my links, anything you buy in that shopping trip gives me a commission. I don't know if you're buying 50 sweaters or a bulk bag of rice to feed your family. And I don't need to know. You can own as little or as much stuff as you want. Besides, maybe you like to buy books to support the author (an awesome thing) and then donate them. Resources are never inherently bad. It's our responsibility to use them to our benefit.